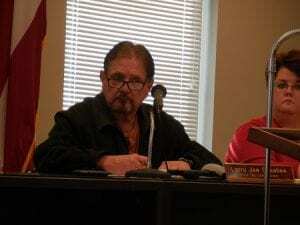 Blue Ridge, Ga – Post 1 Commissioner Earl Johnson asked for revisions in the Public Roads/SPLOST department to clarify the monthly financial reports. The Public Roads and SPLOST (Special Purpose Local Option Sales Tax) represented one line item of the budget summary report. Since financial updates began two years ago, Board of Commissioners’ Chief Financial Officer Robin Gazaway has presented the two items together. Points of interest in the 2019 budget. The third line item was the point of discussion. 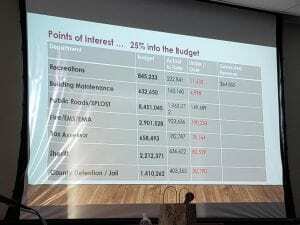 Johnson stated that combining Public Works (budget and expenditures) and SPLOST makes it difficult to recognize where the money is being spent. “I don’t understand why we’re doing a report if I can’t see the numbers,” said Johnson. He also noted that other departments were separated and easier to comprehend. She also suggested providing a detailed financial print report to the commissioners each month since she already has that information pulled for her records. These updates will begin during the next financial update report at next month’s Board of Commissioners’ meeting. Gazaway gives the financial update at the second board meeting of every month, and this report detailed all expenses from Jan. through March 2019. Departments were showing 1% over for the year, but Gazaway pointed out that lump sums, such as the courthouse loan debt and lease payments were due at the beginning of the year. As a result, the numbers should even out as the year goes on. Blue Ridge, Ga. – The Fannin County 2017 audit concluded with much praise from independent accounting firm Rushton and Company. The overall state of finances for the county are “very healthy”. 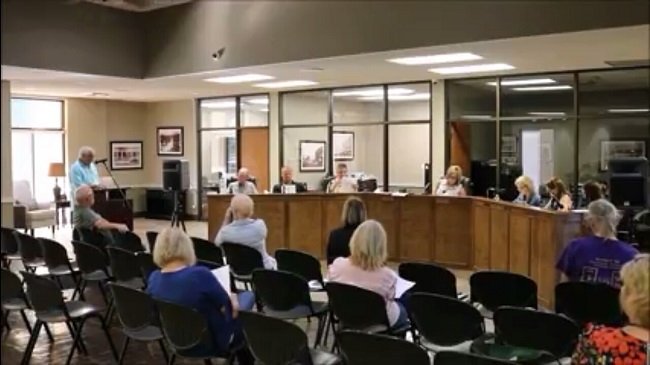 Sam Latimer, CPA and audit manager with Rushton and Company, gave citizens an overview of the Fannin County 2017 audit at the June 26 Board of Commissioners (BOC) meeting. Rushton and Company was hired to analyze the county’s 2017 finances and give an unbiased opinion based on an in-depth look at all county run departments. Latimer noted that working with the county and management had been very easy for the company, and that all county employees had been very cooperative and helpful in providing the firm with all the information they needed to conduct the audit. “You (Fannin County) have a very capable finance department,” Latimer spoke specifically of the work done by Fannin County Finance Director Robin Gazaway. Net assets were among the highlights given by Latimer. Net assets make up the county’s infrastructure (ex. roads and buildings), equipment, restricted funds (ex. SPLOST or Special Purpose Local Option Sales Tax), and unrestricted funds (ex. funds remaining after the first two categories are filled). During the 2017 fiscal year Fannin County net assets grew by $1.6 million, up 27 percent from 2016. Latimer dubbed this increase a “very healthy year for the county”. 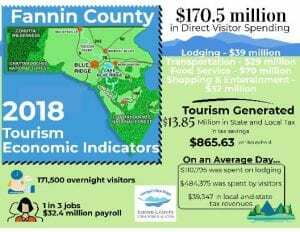 One of the largest components of Fannin County finances is the General Fund, and like the net assets, revenues to this fund showed positive growth with a 5.7 percent increase. Nearly $1,000,000 of taxpayer funds were saved through cuts made to the budget of the Public Works department (Roads and Bridges). The unassigned fund balance did decrease slightly from the previous year of 2016. The funds in this area, however, are still well above standard expectations. According to the Association County Commissioners of Georgia (ACCG) the unassigned fund balance should have enough finances available for a county to operate approximately two months if all revenues stopped. 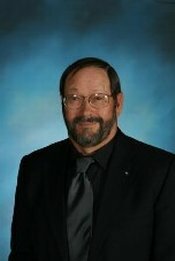 Fannin County Chairman Stan Helton noted that spending had slowed, but stated that the ultimate goal of the county should be to bring expenditures down enough to begin adding revenues back to the fund balance once again. The full 2017 audit , including the management report, will be available for the public to view on the Fannin County Government website. 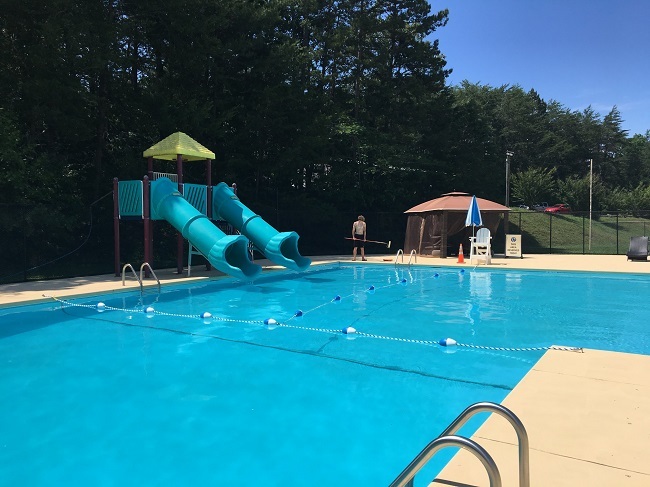 Blue Ridge, Ga. – A large bill for the Blue Ridge City Pool and a final amendment to the City of Blue Ridge 2017 budget left new council members questioning the accountability and practices of the city when it comes to spending. 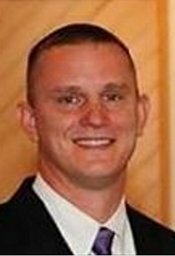 At the June Blue Ridge City Council meeting funds and lack thereof was a topic that was revisited throughout the evening. Blue Ridge Business Association President Cesar Martinez urged the council to take steps to acquire the funding needed for city improvements. “You were all aware of the important issues facing the city, as you voiced your convictions towards better infrastructure, better parking solutions, and better bathroom facilities for our city and its visitors,” Martinez addressed the council reading from a prepared statement. Martinez acknowledged shortfalls in trying to seek funding for these projects stating that grants could take months even years to come through. Blue Ridge Business Association President Cesar Martinez addresses the council about forming a Downtown Development Authority to help seek funding for the city. Mayor Donna Whitener added to this that grants often have to be matched by city money. Offering a possible solution to the lack of funding Martinez urged the council to established a Downtown Development Authority (DDA). Through a DDA the possibility of more funding opens up, funding which the city itself is ineligible to apply for. Martinez cited that there are already 470 registered DDAs in the state of Georgia, and that the city is missing out on opportunities by not establishing a DDA of their own. Council member Kenneth Gaddis thanked Martinez for addressing the council and questioned the city’s lack of focus on infrastructure. “We’re always spending money on infrastructure. We can’t keep up,” Whitener added. Later an amendment to the city’s 2017 budget revealed that the previous council had already spent a large portion of projected revenue for 2018. The previous council had approved for many of the city streets to be repaved in 2017, but the funding was not budgeted. To acquire the funds necessary the council then approved borrowing from the general fund and the Hotel/Motel tax account. The general fund has now been paid back through the use of 2018 SPLOST (special purpose local option sales tax) collections, and the money borrowed from the Hotel/Motel account, in the amount of approximately $135,000, will not be reimbursed. With this revelation and the lack of funding for city projects, such as infrastructure and parking, Council member Nathan Fitts expressed his detestation when asked to approve a check in the amount of $9,608.04 for paint for the city’s pool. According to Whitener the specialized paint is very costly, some of it being up to $263.00 for five gallons. This invoice from Recreonics Inc. coupled with approximately $5,000 already spent on parts to fix the pool, brings the total amount well over the original $5,000 approved by the council earlier this year. Gaddis backed Fitts and questioned how the department got approval to spend this amount. Costly paint for the city pool led council to question if estimates were given before purchase. “I think these department heads need to submit these estimates and bids ahead of time for approval,” Fitts went on. Since the pool had already been painted the council had no choice but to approve to pay this debt. “I don’t think we should have painted it period, but its been painted,” Whitener expressed her opinion. 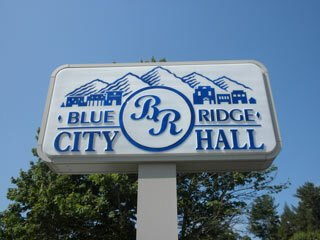 The Blue Ridge City Council will hold their next regular monthly meeting on Tue. July 10 at 6 p.m. at City Hall. At the April 10 Board of Commissioners (BOC) meeting, the commissioners looked into setting up guidelines in Fannin County for the growing trend of tiny homes. 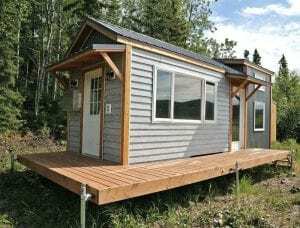 The typical small or tiny house is between 100 and 400 square feet. The building of these structures could pose problems for the county. An example of a finished tiny home. “It could affect people’s property values, adjacent property values, and that’s something that would concern me quite a bit,” Helton said, describing one of the issues that he foresees as a possibility in the future. This discussion came about after a proposed subdivision plat for tiny homes was recently submitted to the county. Chief Land Development Officer Marie Woody presented the board with a sample ordinance to review pertaining to these structures. “I personally think this is something that we are really going to have to pay close attention to,” Post 1 Commissioner Earl Johnson agreed with the concern. Johnson suggested that the county come up with a pre-approval process for those seeking to build tiny home developments. Discussion was made over whether there should be a minimum square footage requirement or a limit to the amount of structures on a property. Helton also pointed out that other counties were having issues with developers using these tiny homes as rental properties. Fannin County Attorney Lynn Doss suggested that the board move to place a short-term moratorium, lasting 6 months to a year, on tiny home developments, stating that this would give the county time to thoroughly research and address the issue with a proper ordinance. Doss and the board agreed that if a moratorium were placed that it would not affect the current submitted tiny house development proposal. The BOC agreed to table this agenda item for two weeks. Johnson added that he would like to see the research focused on counties similar to ours with no zoning. Woody also presented the board with a property in the county that she felt met the requirements for condemnation. This property, located on Ada Street, was the site of a house fire earlier this year. 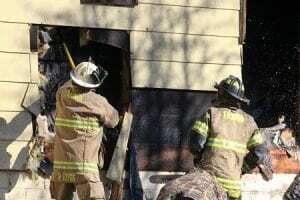 “No effort has been made to fix or repair it,” Woody stated of the burned structure. There are a total of 11 acres that would need to be cleared from this location. On these 11 acres are three homes, seven mobile homes, one garage, one carport, and three additional structures that are full of items. The land surrounding these buildings is also filled with various items. Fire fighters battling the blaze that took place at the Ada Street property in January. Woody reported that the county had received six complaints just in the past two weeks regarding this property and that this has been an ongoing issue, with talks between the county and the property owners, for five years. “I get calls basically pleading with us to do something about this,” Helton said, confirming Woody’s account of complaints. If the county were to pay to have the property cleared, a lien would then be placed on the land, which the owners would have to repay. “We’re not taking someone’s property,” Johnson clarified the process. The board unanimously decided to declare the property dilapidated, a public safety nuisance, and for it to be condemned. Fannin County Finance Director Robin Gazaway presented the BOC with a finalized plan for payment of the new fire station and E-911 center located on Windy Ridge Road. The board agreed to advance monies from the county’s general fund, as well as cash in two county CDs (certificate of deposit). These advanced funds will be paid back over a 27-month period using funds from both SPLOST (Special Purpose Local Option Sales Tax) and the newly allocated 10 percent from Hotel/Motel Taxes. Gazaway also spoke with the board about switching the county over from a single credit card to purchase cards. Currently, the county has one credit card, which department heads must come to the courthouse and check out to use. Gazaway stated that a couple of issues have risen from using the one-card method. Using the one card, the limit for that card is often met before the next billing cycle causing the card to become inactive. Gazaway also stated that some department heads will forget to turn in receipts, causing confusion when the bill arrives, and a need to track down missing receipts. “Several of the counties have a purchase card instead of a credit card,” Gazaway explained. Gazaway presented the board with two options for purchase cards, one from J.P. Morgan and the other from East West Bank, and stated that no local banks offer this option. If the board chose to switch to purchase cards, the county could decide which department heads would be issued a card and the limit for each card. Department heads would have to report all spending to the bank and turn in all physical receipts to the county. Gazaway pointed out that with each department head having individual reporting, missing receipts would be easier to track. Both Sosebee and Johnson expressed concern over extra cards being issued. The BOC agreed to table this item for two weeks and to discuss it at the next monthly meeting to be held April 24 at 5:15 p.m. on the third floor of the courthouse. 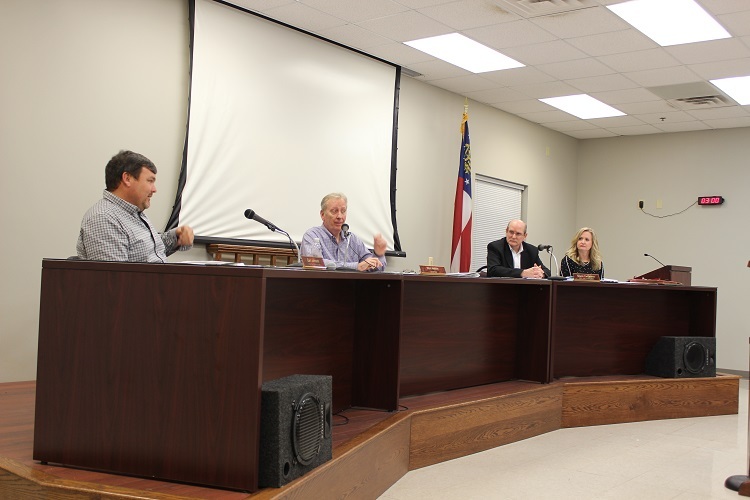 BLUE RIDGE, Ga. – After several discussions the Fannin County Board of Commissioners (BOC) approved a plan for the county to finish funding the new fire station and E-911 center located on Windy Ridge Road. The BOC, under former county Chairman Bill Simmonds, had agreed to a budget of $2.5 million to complete this project, but bids came in higher than projected. “It’s not that we spent more money. We just did a contract that was a little bit more money than they had originally estimated it was going to cost,” Fannin County Finance Director Robin Gazaway further clarified. Discussions at the Feb. meeting brought up the possibility of borrowing the needed funds through a bond company, to which Post 1 Commissioner Earl Johnson firmly stated that he was against this option. Looking into other avenues to pursue for the funding, Gazaway presented the BOC with the possibility of borrowing funds from the county’s general fund and using county CDs (Certificate of Deposit). This option would allow the county to essentially have an interest free advance. By going this route, Gazaway explained that it would save the county roughly $100,000 in interest and an additional $30,000 in fees. At the April 10 BOC meeting the board approved this option for financing with a plan on how and when the county would reimburse the general fund. To finance the remaining balance of the project the county will cash in two CDs, one for $445,000 and another for $75,000, and also borrow approximately $650,000 from the General Fund. “We’re looking at over one million,” Post 2 Commissioner Larry Joe Sosebee clarified the total amount needed for the project’s completion. Post 2 Commissioner Larry Joe Sosebee discusses funding options. To pay back the $650,000 borrowed from the general fund the BOC decided to make the monthly payments by taking half of the payment amount from SPLOST (special-purpose local-option sales tax) and the other half from an extra 10 percent portion of the county’s Hotel/Motel Tax allocated directly to the county this year. Approximated repayment of the advance would take the county 27 months. “I think this is good example of something to use it on,” Johnson added. Helton motioned to accept an advance from the county for this project, with the stipulations that it would be repaid in 27 months using funds from SPLOST and the Hotel/Motel Tax. Johnson seconded the motions and the board approved this move unanimously.